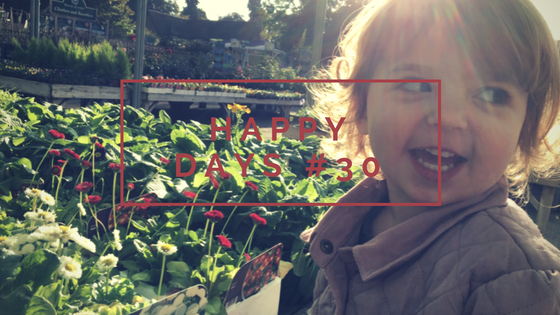 I can’t believe I have been writing my happy list for thirty weeks, the weeks are flying by this year. Every week I love to sit down and reflect on the week and no matter what type of week I thought I had. When it comes to writing this list there are always lots of happy moments to capture. Last weekend I took my niece and Alice to see Stickman at a local theatre. It was our birthday present to my niece and the girls loved it. It was really clever the way they did it and just like the story we all love. It was great to spend this time with my niece and see the two of them together. Andy was away at the weekend and I was flying solo for the weekend. On Sunday we went to a local play barn with my parents and it was really lovely to be able to sit down, enjoy a cup of coffee and watch the girls play in a safe environment. It was a bit pricey, but I think we will definitely go back. Pretty much every week since I’ve had Alice we’ve spent a day with my parents. My girls adore them and they have a really special relationship. Now its just Holly and I, it does seem strange not having Alice with us and we all miss her. But, its also lovely for my parents to have some one on one time with Holly, something they haven’t had much of before. This week was a trip to the garden centre and Holly loved running around sniffing the flowers. I have always loved to take photos, I was always the friend with the camera on a night out. Since starting my blog I have wanted to improve my photos and also learn more about my camera. I attend the basic photography talk at the BlogOn Conference recently and this was really insightful for me. I have been really enjoying talking the camera of auto and getting to learn what each setting does. I have so much to learn still, but I am loving it. Holly and I met our friends at a local garden centre (yes, I live at garden centres! ), it was one that is only ten minutes from us, yet I’ve never been before. We were hoping for a nice dry morning as they have an outdoor play area, but typically it rained. We went anyway and the girls liked looking around and seeing all the christmas bits. We were really pleased to see in the cafe a little table and chairs, with some toys for them to play with. My friend had brought colouring too and they sat nicely for about an hour, while my friend and I drank coffee and chatted. We will definitely be returning! This weekend is a busy one for us, I have some painting to do today (yawn). Then tomorrow its my niece’s birthday and we are all off to her party at a local soft play centre. Haha garden centres are so good for days out aren’t they?? Ooh I love that you’re learning about proper photography, I need to do that too! Sounds like you’ve had a great week. This year really has flown by hasn’t it? How great that they sat and played happily while you and your friend had a catch-up, a definite success! I too need to learn how to create better photos, I now have a canon dlsr which is a start!